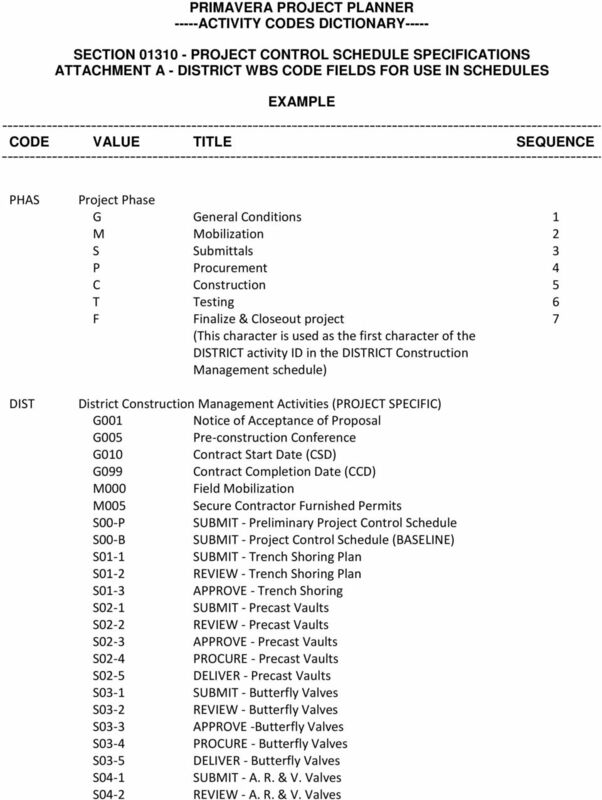 Download "SPECIFICATIONS - DETAILED PROVISIONS Section 01310 - Project Control Schedule C O N T E N T S"
3 Section SECTION PROJECT CONTROL SCHEDULE PART 1 - SCHEDULE REQUIREMENTS PROGRESS SCHEDULE The work specified in this section includes planning, scheduling and reporting required by the CONTRACTOR. It is expressly understood and agreed that the time of beginning, the rate of progress, and the time of completion of the work are essential elements of this CONTRACT. A. 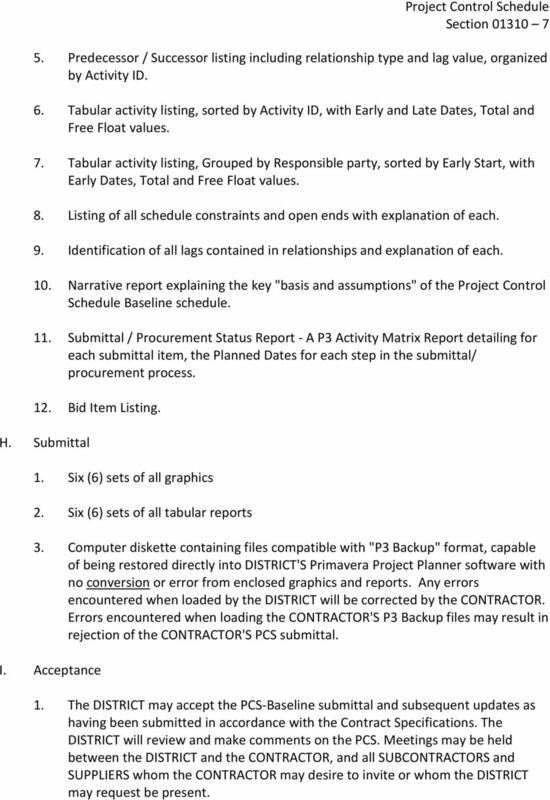 The Project Control Schedule (PCS) shall be prepared and maintained by the CONTRACTOR as described in this section. B. 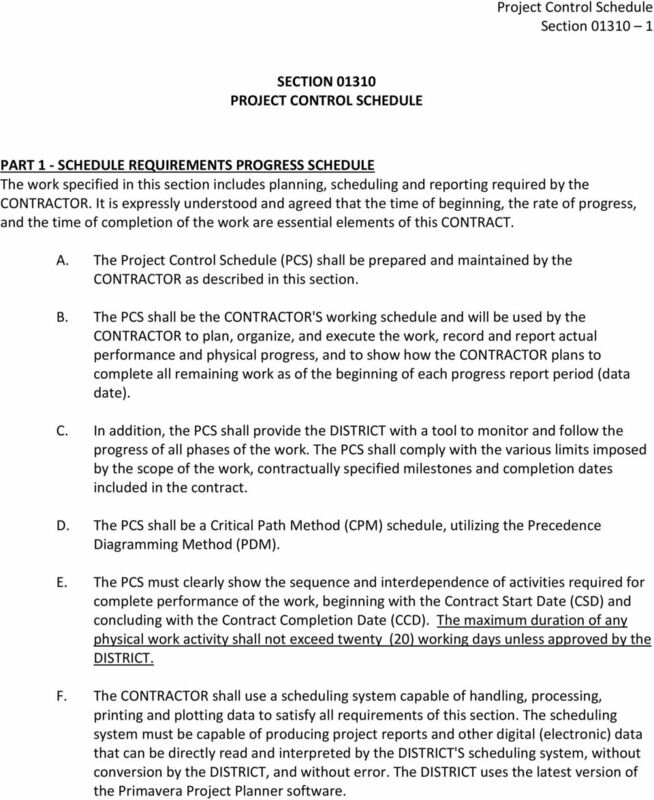 The PCS shall be the CONTRACTOR'S working schedule and will be used by the CONTRACTOR to plan, organize, and execute the work, record and report actual performance and physical progress, and to show how the CONTRACTOR plans to complete all remaining work as of the beginning of each progress report period (data date). C. In addition, the PCS shall provide the DISTRICT with a tool to monitor and follow the progress of all phases of the work. The PCS shall comply with the various limits imposed by the scope of the work, contractually specified milestones and completion dates included in the contract. D. The PCS shall be a Critical Path Method (CPM) schedule, utilizing the Precedence Diagramming Method (PDM). 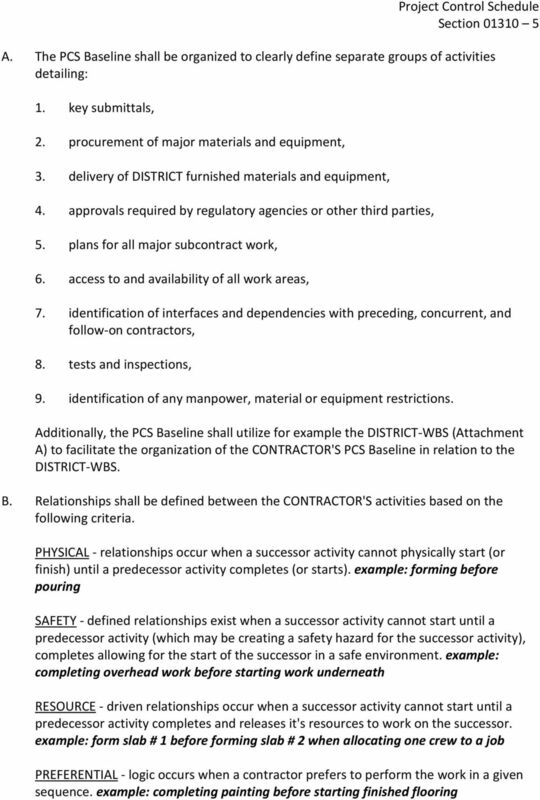 E. The PCS must clearly show the sequence and interdependence of activities required for complete performance of the work, beginning with the Contract Start Date (CSD) and concluding with the Contract Completion Date (CCD). The maximum duration of any physical work activity shall not exceed twenty (20) working days unless approved by the DISTRICT. 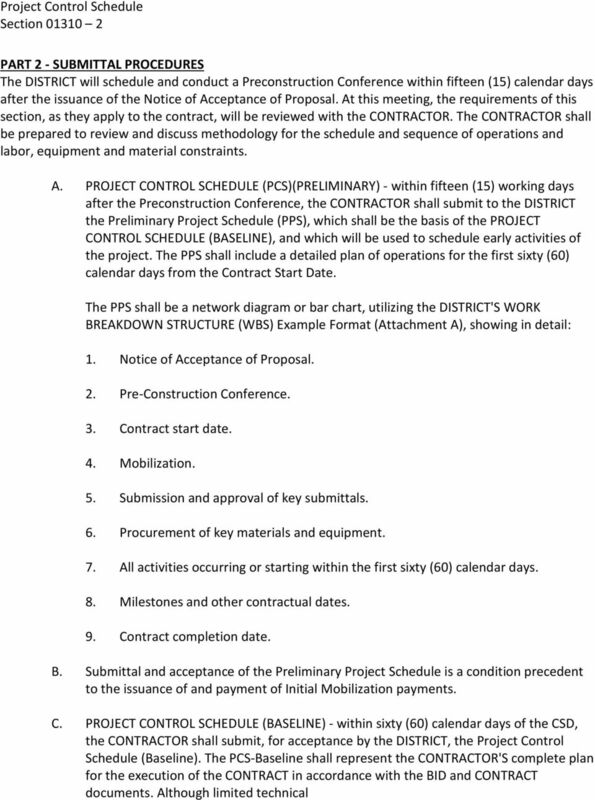 F. The CONTRACTOR shall use a scheduling system capable of handling, processing, printing and plotting data to satisfy all requirements of this section. The scheduling system must be capable of producing project reports and other digital (electronic) data that can be directly read and interpreted by the DISTRICT'S scheduling system, without conversion by the DISTRICT, and without error. 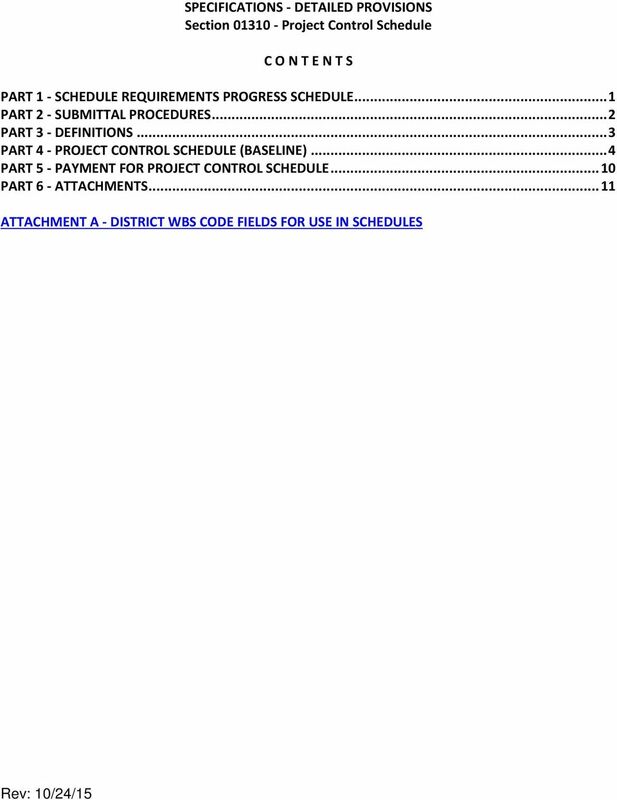 The DISTRICT uses the latest version of the Primavera Project Planner software. 5 Section assistance is available to the CONTRACTOR from the DISTRICT upon written request and prior to any formal review and/or finalization of the baseline schedule, it is the responsibility of the CONTRACTOR to employ or engage the services of a technically qualified scheduler on this project. The PCS-WBS shall be similar to the DISTRICT-WBS (Attachment A). 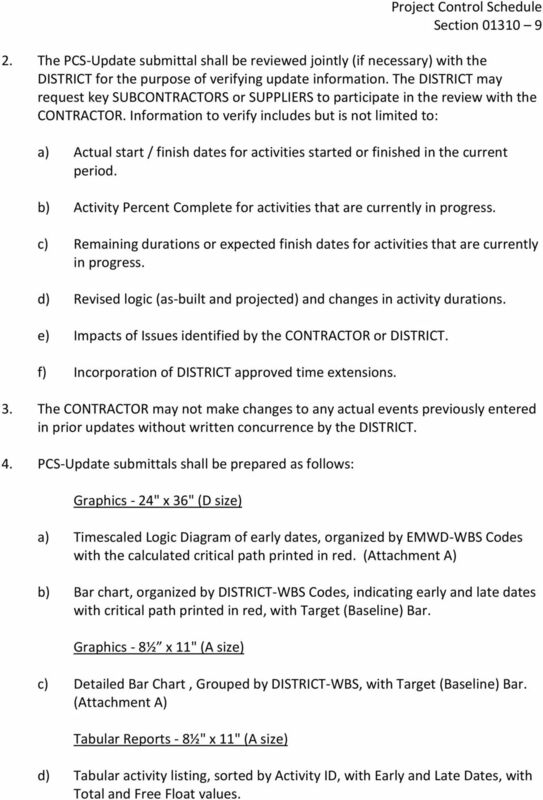 D. PROJECT CONTROL SCHEDULE (UPDATES) - Once each month, or more often if deemed necessary by the DISTRICT, the CONTRACTOR shall review and update the PCS to incorporate all current information, including progress, approved adjustments of time and logic, and proposed changes in sequence and logic. All copies of the updated PCS submitted to the DISTRICT, shall be signed and dated by the CONTRACTOR. 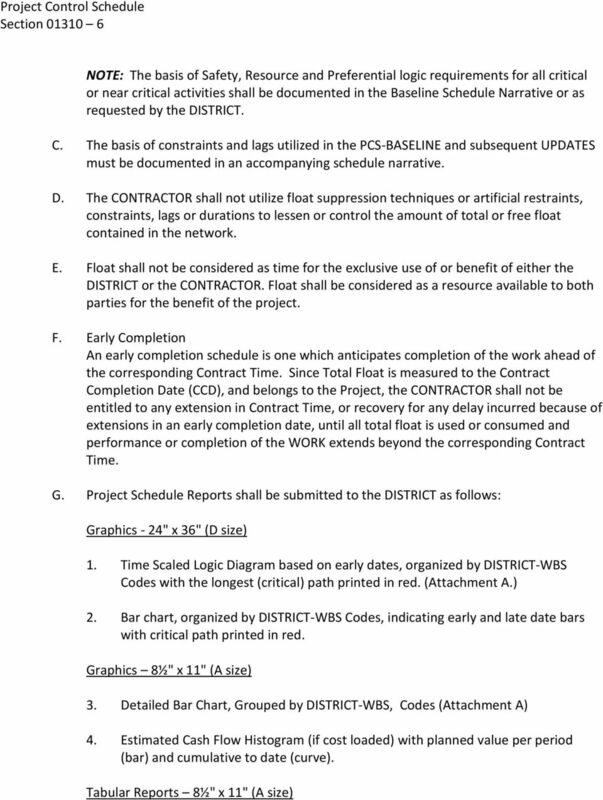 E. PROJECT CONTROL SCHEDULE (AS-BUILT) - The last PCS update submitted shall be identified as the "As-Built Schedule", and is a condition precedent to issuance of Final Acceptance of the CONTRACT by the DISTRICT. PART 3 - DEFINITIONS The principles and definitions of the terms used herein shall be as set forth in the Associated General Contractors of America (AGC) publication "The Use of CPM in Construction," copyright Additional definitions are set forth as follows: A. Critical Path(s) - shall be defined as the longest path of activities from the Contract Start Date (CSD) to the Contract Completion Date (CCD). B. Near Critical Path - shall be defined as those paths of activities having a total float value equal to the total float value of the defined critical path (longest path) plus ten (10) working days. C. Activity Codes - are values assigned to schedule activities to organize the Schedule Activities into manageable groups for updating, analyzing, reporting, plotting, and summarizing. D. WBS - (Work Breakdown Structure) is a definition of project related activity codes, to be used by the CONTRACTOR to organize the CONTRACTOR'S Project Control Schedule in a manner that facilitates the DISTRICT'S use of the PCS information. E. Constraint - is a restriction imposed on the start, finish or duration of an activity. F. Data Date - (DD) The date used as the starting point for schedule calculations. For Baselines, the DD is the first day of the project, the CSD date. For subsequent schedule updates, the DD is the first workday of the remainder of the schedule, normally the first calendar day after the schedule close-out date (usually month end). 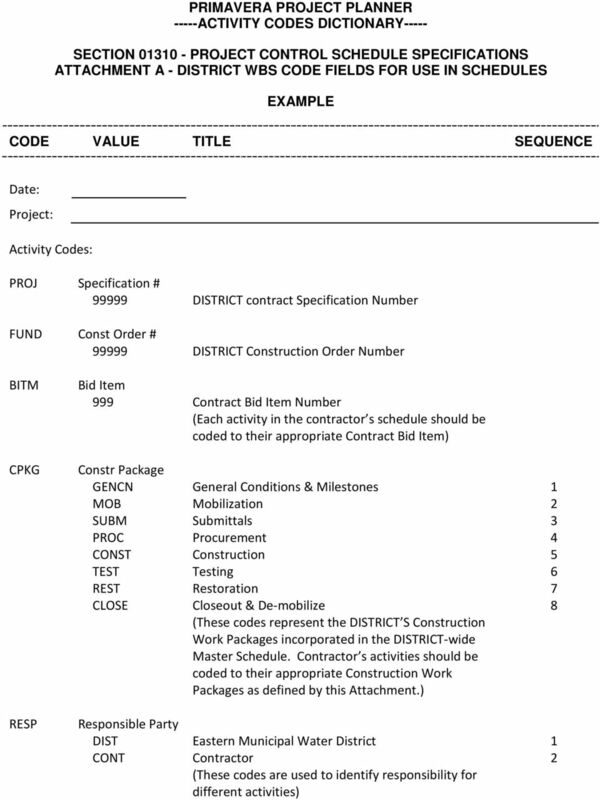 6 Section G. Total Float - is the amount of time that the start or finish of an activity can be delayed without impacting the Contract Completion Date. Total float is a CALCULATED value. H. Free Float - is the amount of time that the start or finish of an activity can be delayed without impacting the early start or finish of a successor activity. Free float is a CALCULATED value. I. Lag - is an offset or delay from an activity to it's successor, or from it's predecessor. Lag is physically defined by the scheduler. Lag is NOT CALCULATED. J. Open End - is an activity that has either no predecessor or no successor relationships. K. Out of Sequence Progress - means that all or a portion of an activity has been completed before the predecessors to the activity are complete. L. Percent Complete - the portion of an activity that is complete based on physical measurement of the scope of work included in the activity that has been completed by the CONTRACTOR and accepted by the DISTRICT. M. Target (Baseline) - a different version of the project schedule that can be compared to as the basis for measuring differences between the versions of the project schedule. 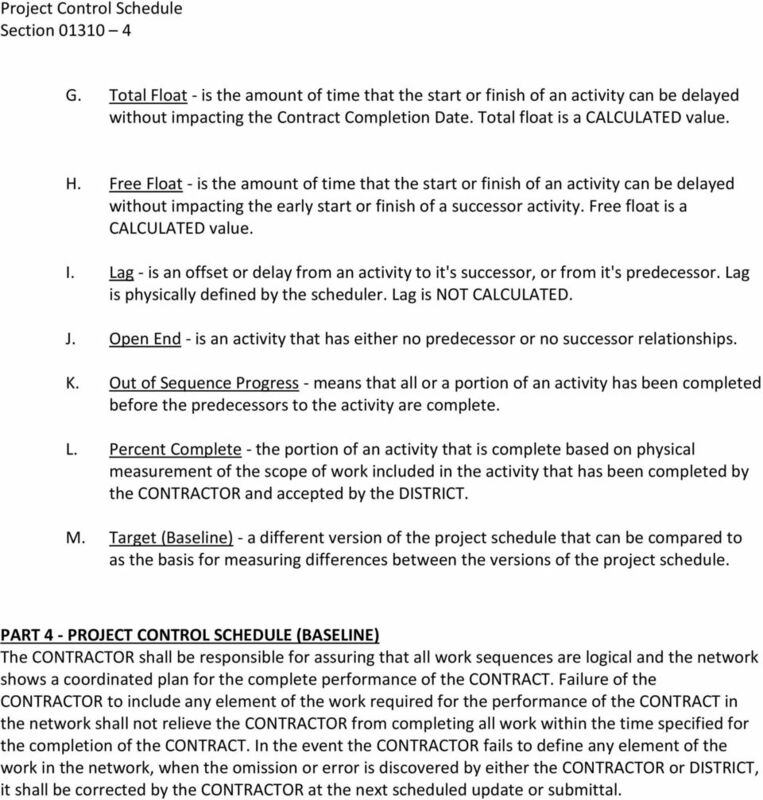 PART 4 - PROJECT CONTROL SCHEDULE (BASELINE) The CONTRACTOR shall be responsible for assuring that all work sequences are logical and the network shows a coordinated plan for the complete performance of the CONTRACT. Failure of the CONTRACTOR to include any element of the work required for the performance of the CONTRACT in the network shall not relieve the CONTRACTOR from completing all work within the time specified for the completion of the CONTRACT. In the event the CONTRACTOR fails to define any element of the work in the network, when the omission or error is discovered by either the CONTRACTOR or DISTRICT, it shall be corrected by the CONTRACTOR at the next scheduled update or submittal. 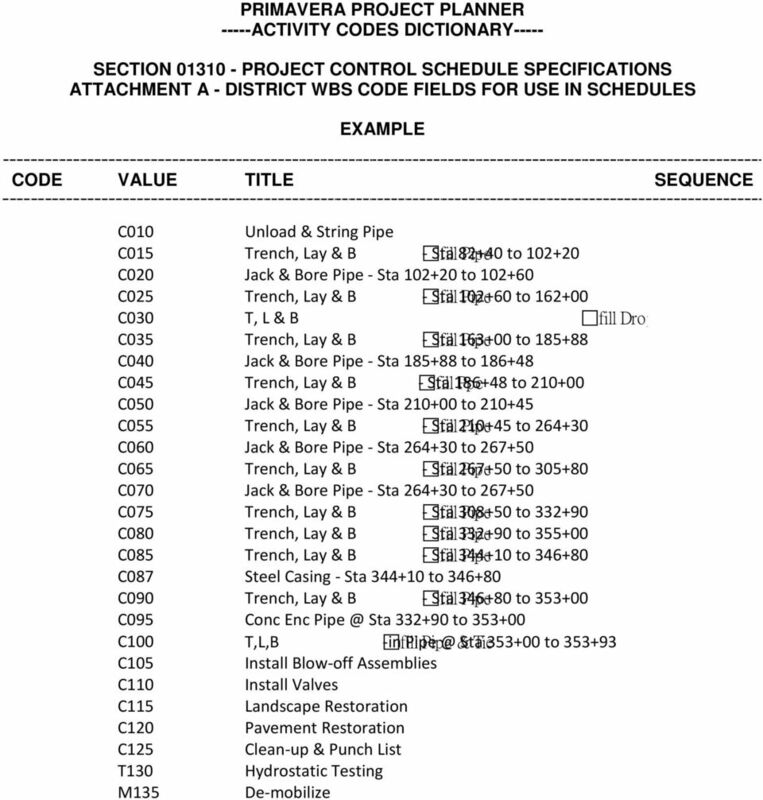 9 Section Predecessor / Successor listing including relationship type and lag value, organized by Activity ID. 6. Tabular activity listing, sorted by Activity ID, with Early and Late Dates, Total and Free Float values. 7. Tabular activity listing, Grouped by Responsible party, sorted by Early Start, with Early Dates, Total and Free Float values. 8. Listing of all schedule constraints and open ends with explanation of each. 9. Identification of all lags contained in relationships and explanation of each. 10. 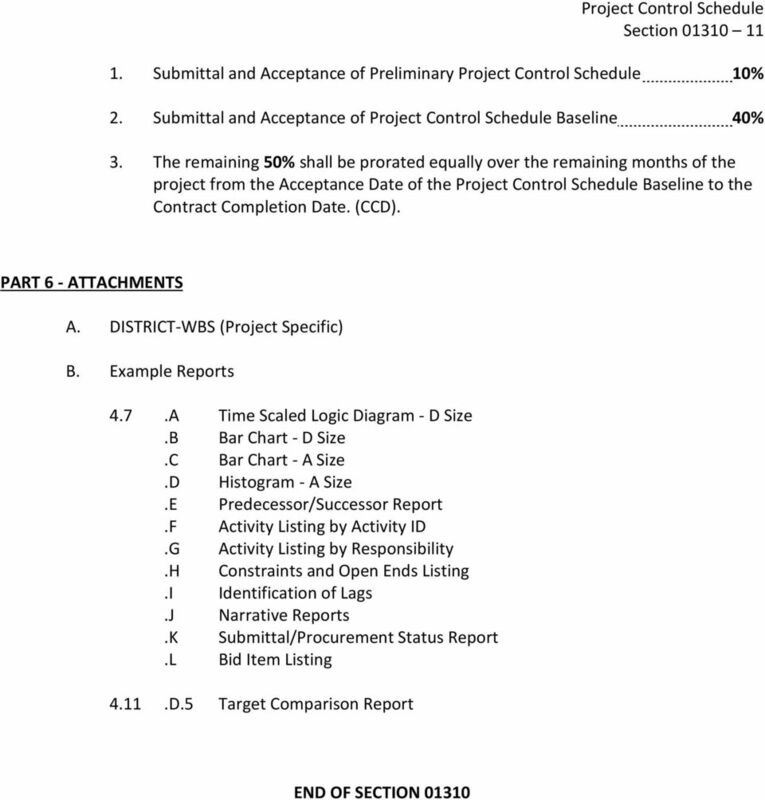 Narrative report explaining the key "basis and assumptions" of the Project Control Schedule Baseline schedule. 11. 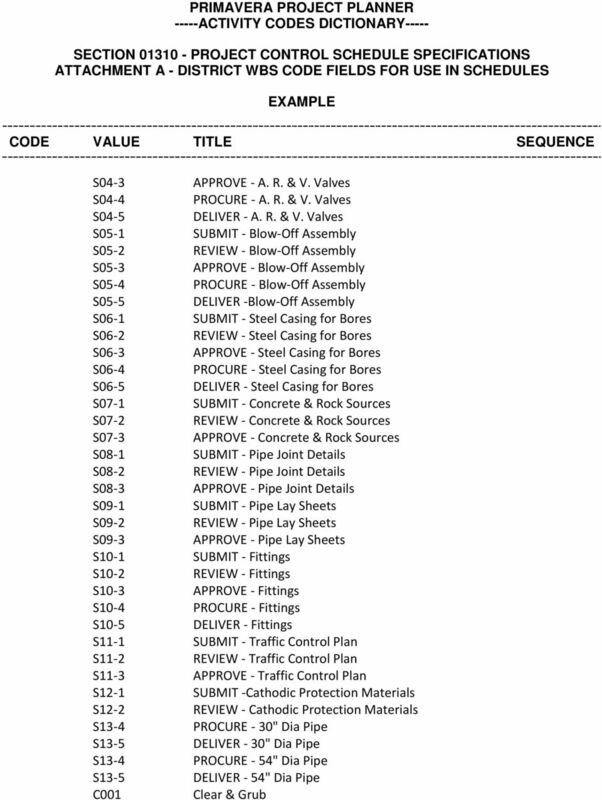 Submittal / Procurement Status Report - A P3 Activity Matrix Report detailing for each submittal item, the Planned Dates for each step in the submittal/ procurement process. 12. Bid Item Listing. H. Submittal 1. Six (6) sets of all graphics 2. Six (6) sets of all tabular reports 3. Computer diskette containing files compatible with "P3 Backup" format, capable of being restored directly into DISTRICT'S Primavera Project Planner software with no conversion or error from enclosed graphics and reports. Any errors encountered when loaded by the DISTRICT will be corrected by the CONTRACTOR. Errors encountered when loading the CONTRACTOR'S P3 Backup files may result in rejection of the CONTRACTOR'S PCS submittal. I. Acceptance 1. The DISTRICT may accept the PCS-Baseline submittal and subsequent updates as having been submitted in accordance with the Contract Specifications. The DISTRICT will review and make comments on the PCS. Meetings may be held between the DISTRICT and the CONTRACTOR, and all SUBCONTRACTORS and SUPPLIERS whom the CONTRACTOR may desire to invite or whom the DISTRICT may request be present. 10 Section The PCS submittal must meet in all respects the time and order of work requirements of the contract. The work shall be executed in the sequence indicated in the accepted baseline and subsequent accepted updates and revisions. 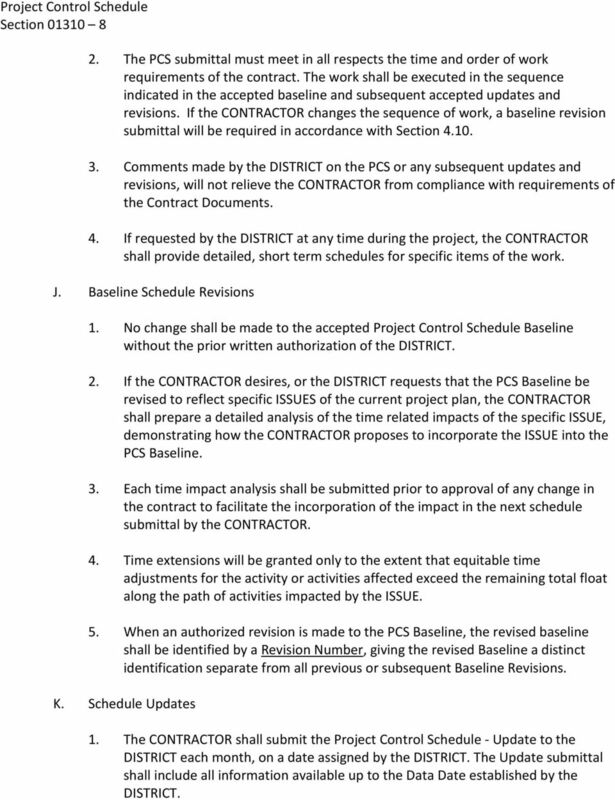 If the CONTRACTOR changes the sequence of work, a baseline revision submittal will be required in accordance with Section Comments made by the DISTRICT on the PCS or any subsequent updates and revisions, will not relieve the CONTRACTOR from compliance with requirements of the Contract Documents. 4. 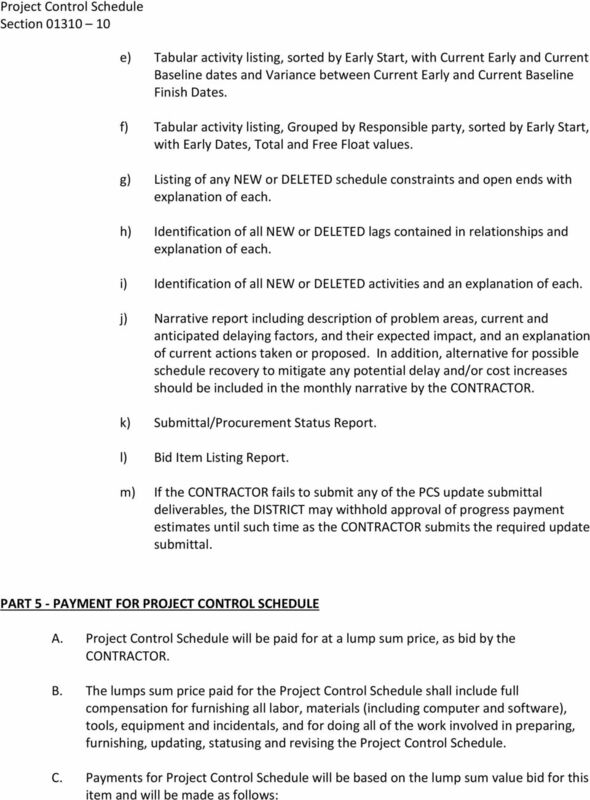 If requested by the DISTRICT at any time during the project, the CONTRACTOR shall provide detailed, short term schedules for specific items of the work. J. Baseline Schedule Revisions 1. No change shall be made to the accepted Project Control Schedule Baseline without the prior written authorization of the DISTRICT. 2. 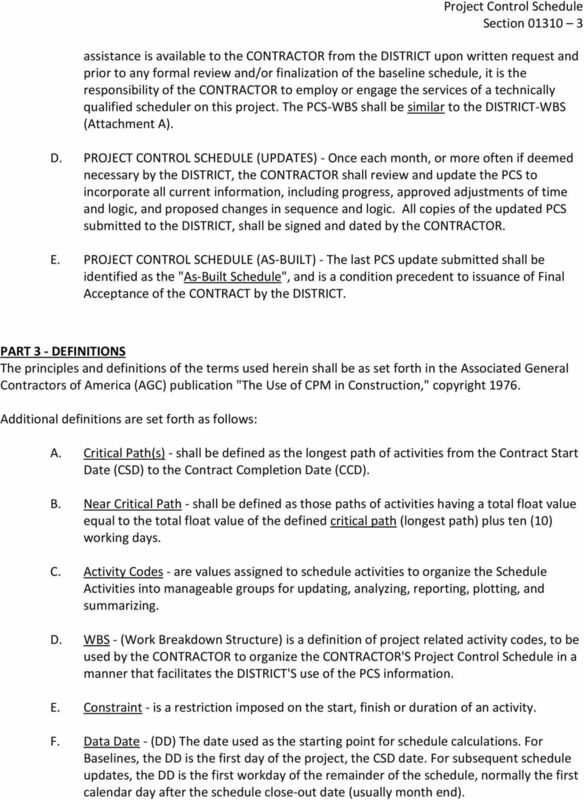 If the CONTRACTOR desires, or the DISTRICT requests that the PCS Baseline be revised to reflect specific ISSUES of the current project plan, the CONTRACTOR shall prepare a detailed analysis of the time related impacts of the specific ISSUE, demonstrating how the CONTRACTOR proposes to incorporate the ISSUE into the PCS Baseline. 3. Each time impact analysis shall be submitted prior to approval of any change in the contract to facilitate the incorporation of the impact in the next schedule submittal by the CONTRACTOR. 4. Time extensions will be granted only to the extent that equitable time adjustments for the activity or activities affected exceed the remaining total float along the path of activities impacted by the ISSUE. 5. When an authorized revision is made to the PCS Baseline, the revised baseline shall be identified by a Revision Number, giving the revised Baseline a distinct identification separate from all previous or subsequent Baseline Revisions. K. Schedule Updates 1. The CONTRACTOR shall submit the Project Control Schedule - Update to the DISTRICT each month, on a date assigned by the DISTRICT. The Update submittal shall include all information available up to the Data Date established by the DISTRICT. 11 Section The PCS-Update submittal shall be reviewed jointly (if necessary) with the DISTRICT for the purpose of verifying update information. The DISTRICT may request key SUBCONTRACTORS or SUPPLIERS to participate in the review with the CONTRACTOR. Information to verify includes but is not limited to: a) Actual start / finish dates for activities started or finished in the current period. b) Activity Percent Complete for activities that are currently in progress. c) Remaining durations or expected finish dates for activities that are currently in progress. d) Revised logic (as-built and projected) and changes in activity durations. e) Impacts of Issues identified by the CONTRACTOR or DISTRICT. f) Incorporation of DISTRICT approved time extensions. 3. The CONTRACTOR may not make changes to any actual events previously entered in prior updates without written concurrence by the DISTRICT. 4. PCS-Update submittals shall be prepared as follows: Graphics - 24" x 36" (D size) a) Timescaled Logic Diagram of early dates, organized by EMWD-WBS Codes with the calculated critical path printed in red. (Attachment A) b) Bar chart, organized by DISTRICT-WBS Codes, indicating early and late dates with critical path printed in red, with Target (Baseline) Bar. Graphics - 8½ x 11" (A size) c) Detailed Bar Chart, Grouped by DISTRICT-WBS, with Target (Baseline) Bar. (Attachment A) Tabular Reports - 8½" x 11" (A size) d) Tabular activity listing, sorted by Activity ID, with Early and Late Dates, with Total and Free Float values.